Entitled Scan Pyramids, an international project to uncover the secrets of the pyramids, is to be implemented at the end of October, Egypt's antiquities minister revealed to Ahram Online in an exclusive interview. Mamdouh Eldamaty said that the project aims to solve the enigma of the Old Kingdom pyramids at Dahshur and Giza and to provide a better understanding of their architecture and interior designs. The project, Eldamaty continued, will also provide 3D photos and a detailed study of pyramidal architecture in Egypt. The minister added that the cosmic rays are immensely high-energy radiation, mainly originating outside the solar system, that are also used by the Japanese for early detection of volcanoes and earthquakes. The Scan Pyramids survey, Eldamaty pointed out, will be the first time that a cosmic rays laboratory has been established outside Japan and will be only the second one ever. 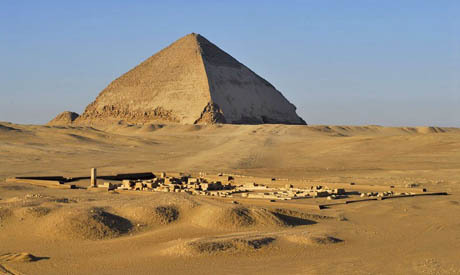 "King Senefru's Bent Pyramid in Dahshur was selected to be the first pyramid that will be subjected to such a survey due to its distinguished and unique architectural design and because it is the first attempt at pyramid construction that has not been carefully studied," Eldamaty told Ahram Online. Eldamaty said that the survey is a joint venture between Japan and Egypt in collaboration with a consortium from the Faculty of Engineering at Cairo University, as well as the Heritage Innovation and Preservation Institute in France, all of which are under the supervision of the Ministry of Antiquities. The Scan Pyramids project was approved by the permanent committee at the antiquities ministry and has obtained all the necessary permission from security agencies and other concerned authorities. A press conference is to be held on Sunday at the Mena House Hotel in Giza to announce the launching of the Scan Pyramids project. Will the scanning look for hidden chambers i e muon tomography? Between satellite imaging and muon tomography and constantly imporving technology, dramatic breakthroughs in making important discoveries in Egypt will surely follow. Scans of pyramids, temples, the floor and adjacent wadis of the Valley of the Kings, the New Kingdom temples, graveyards or anything should be avidly pursued. Technology will eventually make transparent the desert! Great treasures must surely await.